How do FPF ads work? Every day we publish tens of thousands of e-newsletters filled with neighborhood news. Your message can reach all of Vermont, or you can target hand-picked towns. Tell us where and when and we'll deliver your message! Ads appear in the middle of the FPF newsletter just under the posting summary. Running for office? Working on a campaign? Then you should check out FPF's Paid Campaign Posting option. Simply want to post on your local FPF e-newsletter and appear in the FPF Business Directory? Click here to learn about free or paid FPF Business Access Plans. Don't take our word for it... See More Advertiser Testimonials! Our limited ad inventory sells out quickly so book now to get your preferred dates. Ads run by the week, Sunday to Saturday. Inquiries? Jodi, Suzie or Wendy are ready to assist: localbiz@frontporchforum.com or 802-540-0069 x1. What do FPF ads look like? Wait... What is Front Porch Forum? Haven't heard of FPF before? See how 160,000+ members are using it across Vermont. 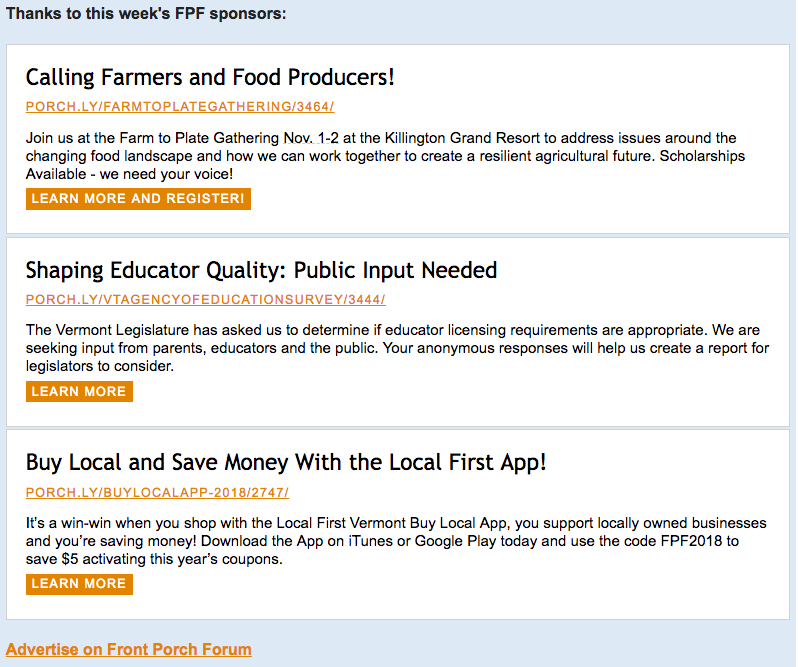 Check out this brief overview from our partners at the Vermont Council on Rural Development for a primer on how people use Front Porch Forum. *FPF charges a cancellation fee of $75 flat, or 10% of the total order, whichever is greater. The advertiser is also expected to pay for any ads that ran before the cancellation. To learn more about advertising your business on FPF please contact Wendy, Jodi or Suzie at localbiz@frontporchforum.com or 802-540-0069 x1. Thank you! To simply submit a posting to your local FPF (e.g., car for sale, apt. for rent, yard sale), just click LOGIN (if not already logged in), then click COMPOSE POSTING. Contact membersupport@frontporchforum.com with questions.